The countdown is officially on! If the May 25th, 2018 is circled in red on your calendar, you probably belong to the large group of marketers and data protection officers who are currently rolling up their sleeves to review the quality of their mailing database, their websites’ subscription settings, and data storage workflows to make sure that their company will be 100% compliant with the EU General Data Protection Regulation (GDPR). 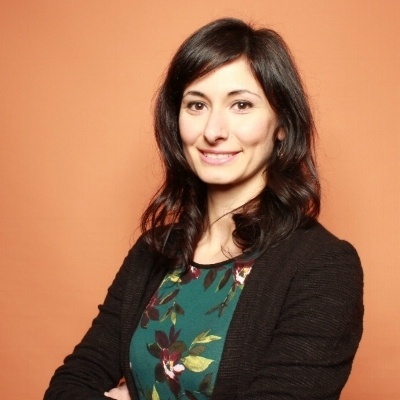 While the EU General Data Protection Regulation represents undoubtedly the most substantial change in data protection regulations in the past 20 years, giving hordes of marketers many sleepless nights, it also provides an unparalleled opportunity for companies to improve the quality of their database and the success rate of their email marketing campaigns, by cleansing their mailing list of inactive subscribers. 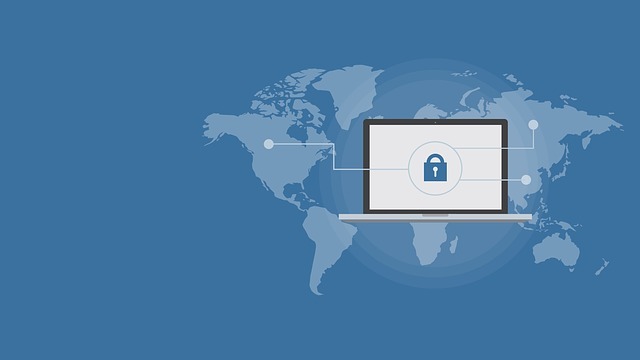 Although becoming fully compliant will require a multitude of procedures and changes on the legal and marketing fronts, you can take your first step towards GDPR by running a permission pass campaign. What is a permission pass campaign? 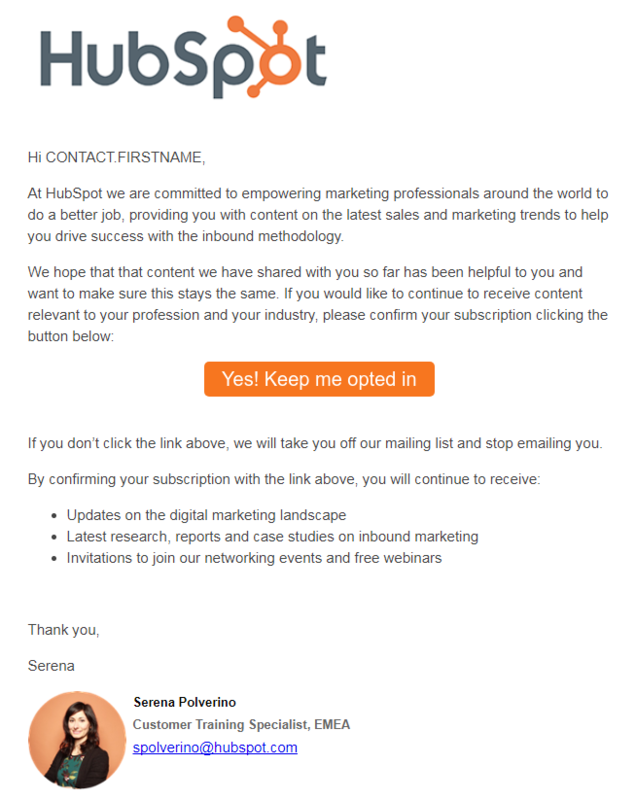 Asking permission from your subscribers and making sure that the content they receive is still valuable to them are core elements of inbound email marketing, that’s why HubSpot has been a great supporter of permission pass campaigns long before the new data protection regulation became a priority for all companies operating in the EU. In a nutshell, a permission pass campaign is a one-time email campaign that will request any contacts with an unverified opt-in status to confirm that they still want to receive emails from you. This type of campaign will allow you to verify the opt-in status of your subscribers and keep in your database only those contacts who still see value in your emails, and for this reason are more likely to engage with your content. Win-win-win: you remove disengaged contacts from your CRM; your subscribers receive more of the content they enjoy; your email marketing campaigns will see a healthy spike in open and click-through rates. Let’s see how we get started then! 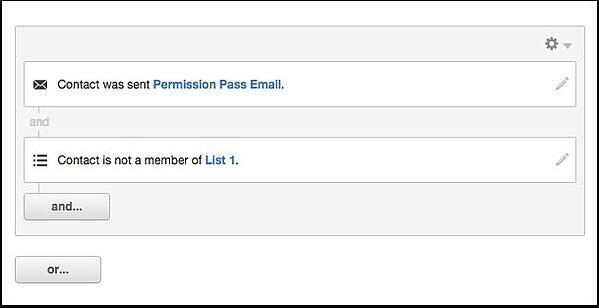 To prepare your database for the screening you’re going to do with a permission pass campaign, make sure you enable the re-subscription emails feature for forms in HubSpot before launching your campaign. Once enabled, this feature allows contacts who in the past opted out of your mailing list to re-subscribe when filling out a new form on your website. The goal of your permission pass email is to establish who are the subscribers in your database who want to continue receiving your emails. To this end, you want to start identifying disengaged contacts by creating a smart list of subscribers who have not engaged with your emails recently. This is the email that will give your contacts the opportunity to confirm their opt-in status and should therefore include a CTA to encourage recipients to confirm their subscription. While this email should be very short and state clearly its goal – confirm opt-in status – you may want to take this opportunity to give your recipients a valid reason to opt in and remind them of the benefits of continuing to receive emails from you. Just like any email campaign, split testing can help you optimize the effectiveness of your message. For your permission pass campaign, you may want to create at least two variations of your email to test a different subject line, general tone, personalization, and preview text. For example, you may want to try to offer an incentive in one of the variations (e.g. discounts, exclusive invites, additional benefits), and measure whether subscribers would be more willing to opt in under that circumstance. Whether you decide to split test the subject line, the body of the email, or the CTA, make sure to test only one variation per email to be able to identify the winning element, and ideally try to run your test on a group of 200-500 contacts per each variation. Don’t forget to include an unsubscribe link in any variations and fully optimize your emails for mobile readers. To give your contacts enough time to open the email, it is recommended to send a reminder one week after your first email, using an incisive subject line to alert recipients that action is required within the email (e.g. 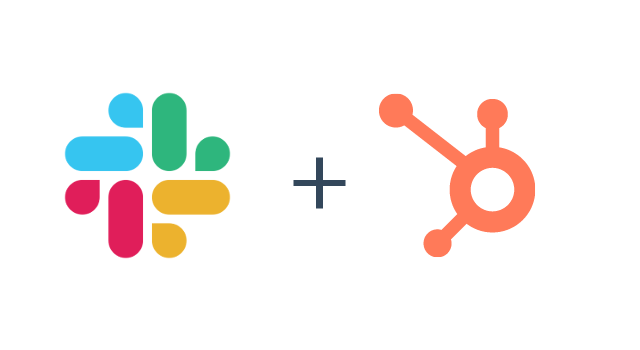 Action Required: one click to continue receiving HubSpot emails). 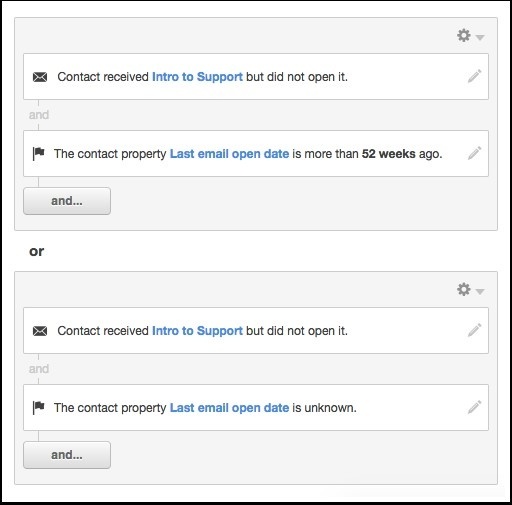 If you’re sending your emails through HubSpot, the recipients tab will give you an overview of which contacts took action on the email. Only those contacts who confirmed their opt-in status should continue to stay in your database and receive emails from you. On the other hand, the contacts who did not click your CTA should be opted out of all future emails as they might harm your email reputation and the overall performance of your email marketing efforts. List 1: Contact clicked a link in Permission Pass Email. List 2: Contact was sent Permission Pass Email and IS NOT a member of List 1. 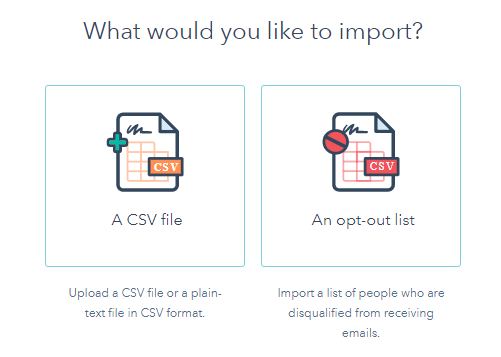 Now that you have identified which contacts didn’t engage with your permission pass campaign (list 2), you can export the list as a CSV file and re-import them into the CRM as an opt-out list. By doing this, you will prevent potentially harmful contacts from impacting your deliverability score and overall performance of future email marketing campaigns. 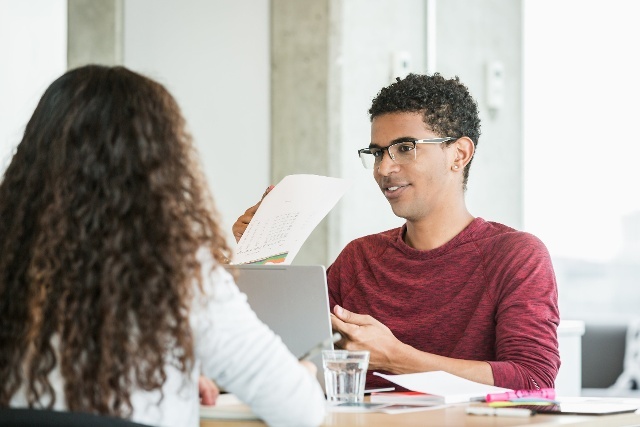 Depending on the type of business and lead generation efforts, it is usually sufficient to run a permission pass campaign once a year and keep monitoring your contacts’ activity quarterly through re-engagement campaigns. One thing is for sure: becoming GDPR-compliant is on every marketer’s new year’s resolutions list, and over the next few months, EU citizens will be overwhelmed by a wave of emails from companies from all over the world seeking to confirm their opt-in status, so the sooner you take action, the easier it will be to grab their attention and receive a response. 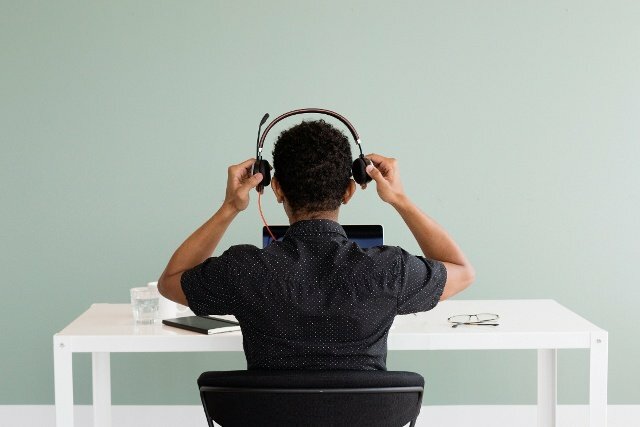 Although asking your subscribers to confirm their opt-in status with the risk of losing a significant portion of your contacts sounds like a nightmare for any marketer, it is not only a safe way to avoid GDPR penalties, but also an excellent opportunity to revise your company’s approach to customers and prospects and deliver a more satisfying user experience. While it is recommended to seek legal advice to be fully compliant with the new regulations, running a permission pass campaign represents a first effective step towards compliance, along with many other GDPR-friendly features already available in the HubSpot software. 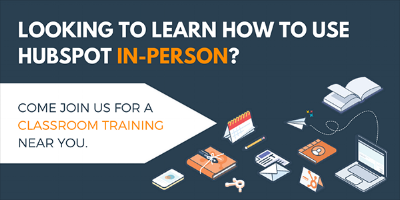 If you would like to learn more on how to manage efficiently your contacts database, maximize the impact of your lead generation campaigns with inbound marketing best practices, and drive alignment across your sales and marketing teams, check out HubSpot’s 2018 classroom training dates and join other sales and marketing professionals for a live hands-on training in a city near you. Interested to see what consumers think of the GDPR? We surveyed over 3,000 consumers in the UK, Ireland, Germany, Austria, and Switzerland to find out. Check out our report here.